I love these patterns so much. Let's do it one more time. I know… we've done this a couple of times already – see here – and here. And of course, those with the YTC Price Action Trader should look to Volume 2, Chapter 3, Page 143, for the same idea expressed on the Trading Timeframe. But I want to do it one more time, just to really emphasise the point. In the right context these Test/Breakout Failures of momentum extremes can provide GREAT opportunity. Regardless of your chosen market and timeframe, if this idea appeals to you then I highly recommend you look through your charts (both trading and higher timeframes) and study some historical examples. You may then want to keep an eye out for them in future. 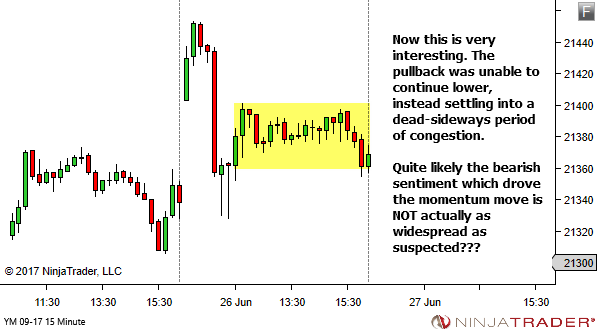 So to look at yet another market, let's see one that occurred in the emini Dow (YM) futures earlier this week. 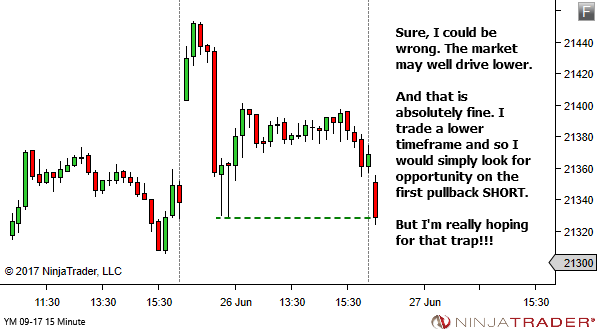 I watch for this on both higher timeframes AND on the trading timeframe. This example actually occurs on both. Let's start with a higher timeframe, using the 15 minute as it provides a good "fit" on the image. 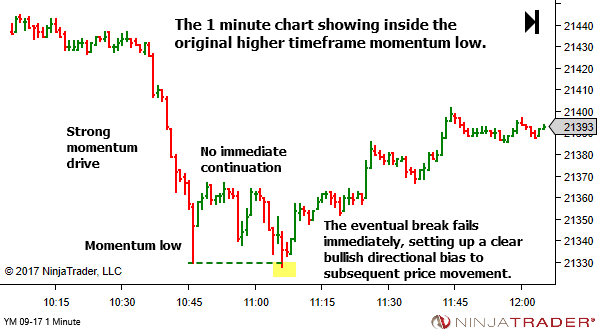 I mentioned earlier that this momentum drive also offered a Trading Timeframe example. That would be for those on the 1 minute YTC Scalper timeframes. You'll note if you look at the 15 minute charts above you'll see the momentum low actually included two candles with bottoming tails. On the lower timeframe chart this is yet another example of this same pattern. 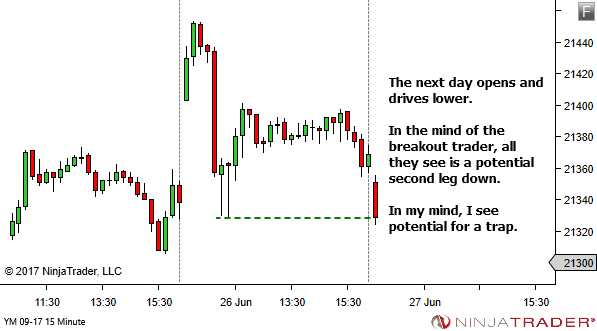 Let's look at the 1 minute chart showing the "internal detail" comprising these bottoming tail lows. 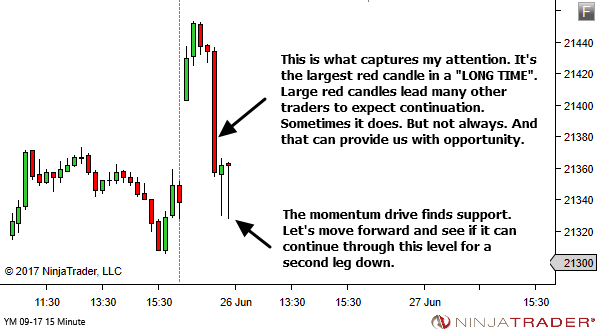 Keep an eye out for large momentum moves. 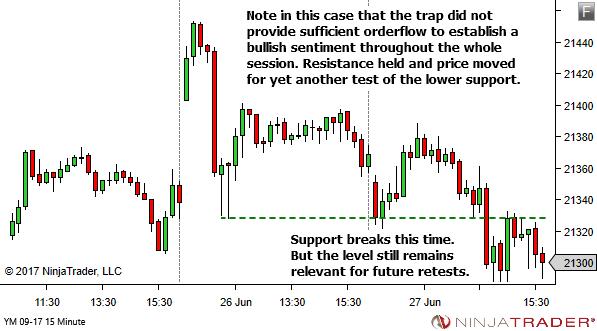 Those on the trading timeframe can offer nice movement for a swing or two. 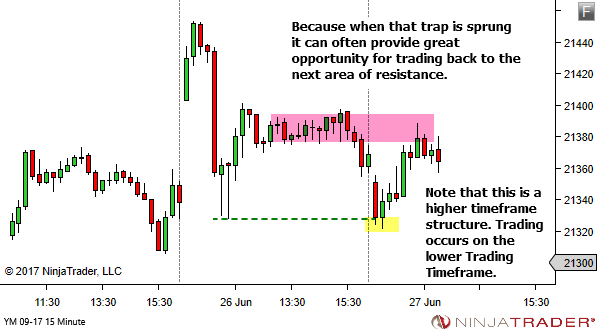 Those on the higher timeframe structure can offer a clear directional bias for a longer period of time, often a whole session. 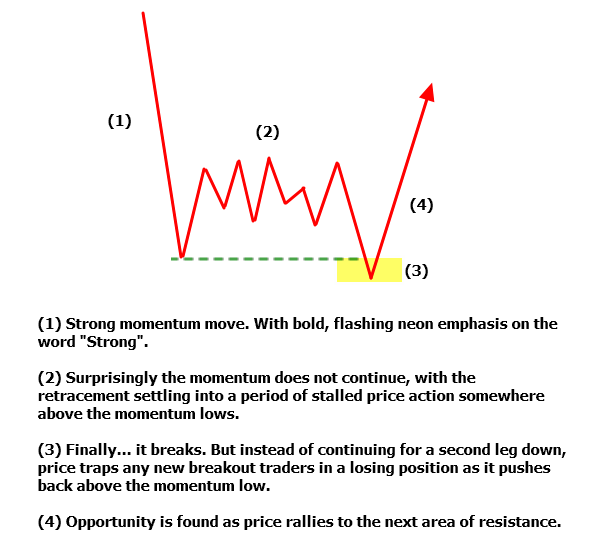 The first pullback does not lead to immediate continuation. An eventual break of the momentum extreme, which rapidly fails. Have you been trading the YM this week? Even on the 1-minute NQ chart, the candles have been been large.